Letter to Sinead and Mark. October 21, 2012. See ‘Mass Readings’ on Home Page, for the readings for this 29th Sunday. The Gospel is Mark 10:35-45. 29TH SUNDAY IN ORDINARY TIME OCTOBER 21ST, 2012. Hope your week was great! How did you make out with the challenges of last Sunday and the meeting of the rich young man with the Rabbi, Jesus. A tough one, that was. Jesus tried to ‘turn him upside down’ so the young man might see things from the perspective of the poor and those low down on the ladder. Today, we meet two social climbers, who also happened to be part of Jesus’ inner circle,- James, and his brother John. Again and again, throughout the three years of his ministry, Jesus would take his three closest friends aside, meaning Peter, James, and John. They saw him on the mountain, transfigured into a dazzling figure; they were with him when he restored the twelve-year old daughter of Jairus to life; they saw him again in the Garden of Gethsemane, bowed down and sweating great drops like blood, from the terror of what lay before him. In our reading today, two of the same three, James and John, were trying to book the best seats beside Jesus in the ‘Kingdom’ which they expected would be something mightily impressive and powerful. ‘We want to sit on your right and on your left.’ Jesus tried to turn them upside down, too,- like the rich young man last week! ‘You really want to be beside me’, he asked them. 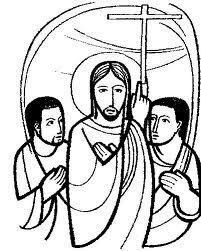 ‘Ok, are you ready to be right beside me when I am scourged, or mocked, or crowned with thorns, or carrying my own cross to my own execution?’ What he asked them was ‘are you willing to drink the cup that I must drink of?’- and they knew he meant the cup of his suffering and death. ‘Are you willing to be baptized (that is, steeped completely) in all that I will have to go through, all of my rejection and ridicule and pain?’ The two lads, God bless their innocence, said ‘Yes! We are willing!’ Little did they understand what they were agreeing to. And then, the others of the twelve were livid with the pair. How dare they try to steal a march on us? The others were hopping mad, as we say, because they too had wanted to be First, beside Jesus, in his Triumph. So Jesus had to turn them on their heads too! He took them all aside, he told them that they had got it all wrong. ‘If you’re going to be my disciple, practise being a servant of others.’ And then, he made that famous statement, which rings out like a bell from Jesus: ‘the son of man did not come to be served but to serve, and to give his life as a ransom for many.’ There’s the upside down view of things that the Master teaches us. It’s the very opposite of Power, Prestige, Lording it over others, and that kind of …stuff. ‘Go down on your knees and wash each other’s feet!’- that’s what he told them later, and that’s what he did himself. 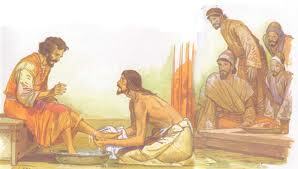 He, the Lord and Master, washed his own disciples feet! That turned things on their head. If you ever go to Lourdes, go there to see the Upside Down world that Jesus talks about. 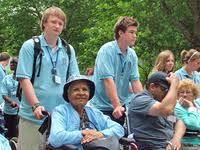 In Lourdes, the sick are the First Citizens, the Little ones are the Most Important, the Poor have a special honour. Those who seem to be ‘nothing’ at home are VIP’s in Lourdes. It’s a joy to see it. It sends you home thinking. And when you do get home, it’s great when you begin to make the same thing happen in your own community and parish,- caring for the most vulnerable, whoever they are. ‘I did not come to be served but to serve’. He did not come to have his own feet washed by some lowly servant: he came to be the lowly servant who washed the feet (that is, tenderly cared for the needs) of others. Mark, Sinead, that’s the challenge for me for this coming week and beyond. Hope you will hear the challenge in your own lives, too. Have a great week,- an Upside Down week! It’s the way to go! God bliss you and bless you both! ← SOUL FOOD FOR THE HUNGRY ADULT: Oct. 14, 2012. 28th Sunday.